I am always experimenting with healthier snacks I can make for the girls. We all love chips, it’s definitely a weakness, so I have been experimenting with healthy finger snacks. Kale chips are a definite favorite for all of us, but I can only eat them so often and they take a few hours to make in the dehydrator. 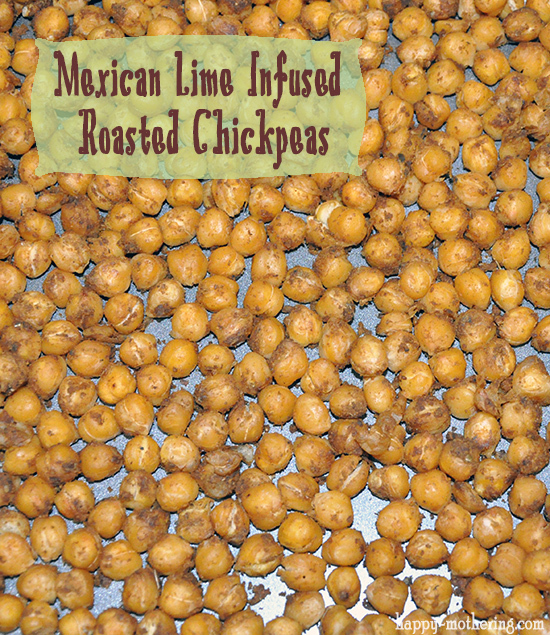 So we started experimenting with roasting chickpeas. I have tried a few different seasonings, but this Mexican Lime Infused version is our favorite so far. Curry was a close second. You can use pretty much any seasoning the same way, depending upon your family’s tastes. Rinse both cans of garbanzo beans thoroughly, until they’re no longer foamy, then [simpleazon-link asin=”B003XPH71O” locale=”us”]strain[/simpleazon-link]. Add the garbanzo beans to a [simpleazon-link asin=”B0000VLPZS” locale=”us”]medium mixing bowl[/simpleazon-link], drizzle the olive oil over then stir. Sprinkle the Mexican seasoning over the garbanzo beans and stir until they’re evenly coated. Pour the chickpeas into a [simpleazon-link asin=”B0026RHHX8″ locale=”us”]9×13 cake pan[/simpleazon-link] and distribute them into an even layer. Put them in your oven for 15 minutes, stir, then put them back in the oven for another 15 minutes. If you want them crispier, you can leave them in for a bit longer. 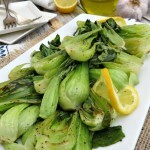 We eat them with our fingers as a snack, but they would also make a great side dish for any meal. I LOVE chickpeas! My son is a fan of watermelon seeds, so I wonder if this could be a crossover recipe for those, too? Great yummy idea! Bookmarking! I’ve never eaten watermelon seeds! I’ll have to look into that. This sounds amazing! I think I am going to make this recipe this week. I have a a bag of chickpeas that I got at whole foods, I am assuming since you are using canned, I should cook these first and then continue to make your recipe? Yes, I would soak (and preferably sprout) them first. Then cook them before roasting. Let me know how it goes! How well do they store? We are planning a hike into the Grand Canyon and I’m looking for healthy recipes to take with us. I’ve actually never tried storing them. Even when I make 2 cans, they’re usually gone within hours. If you try, will you let me know how it turns out?